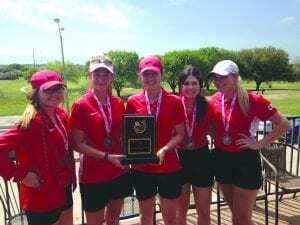 From left, Jourdanton girls golf team members Chesney Cox, Charlotte Staley, Cladi Munoz, Hannah Engelmann and Laney Harlan with their second place plaque at the Randolph Ro-Hawk Invitational. From left, Jourdanton boys golf team members Joseph Brown, Joey Dickey, Ty Smoot, Colby May and Colton Schuchart with their medals after getting third at the Randolph Ro-Hawk Invitational. 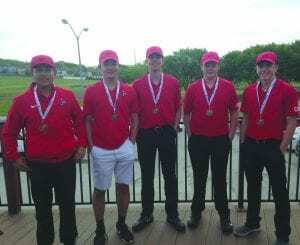 Jourdanton’s golf teams had top-three finishes in their last tournament on Wednesday before district. The Squaws earned second place in the Randolph Ro-Hawk Invitational at Northcliffe Golf Course with a score of 469. Laney Harlan hit 104. Hannah Engelmann hit 112. Charlotte Stacey hit 125. Cladi Munoz hit 128. Chesney Cox shot 129. The Indians placed third at the Randolph Ro-Hawk Invitational at Northcliffe Golf Course with a score of 378. Joseph Brown led the team with a score of 88. Colton Schuchart both shot 94. Colby May hit 102. Joey Dickey hit 103. Jourdanton will host the District 3A-30 tournament at the Pleasanton Country Club on April 1.